Size limits have been a part of fisheries management for decades, but some fear that they are doing more harm than good. One April day, a fisherman named Johan Norman reeled in a female cod near the Norwegian village of Moskenes, where snow-capped mountains rise straight from the sea. He measured the fish: 82 centimetres from the tip of its snout to the tip of its tail. Then he pulled out his knife and sliced off several scales, placing them in a small envelope to deposit at the Institute of Marine Research in Bergen, Norway. The year was 1913. Over the next century, as those scales sat in a repository, radical changes took place in the world's oceans. The small sailing vessels of Norway and other fishing nations were replaced with industrial bottom trawlers. In 1968, the North Atlantic cod harvest started a precipitous decline, as did other stocks, including salmon, sole and lobster. Then, in the early 1980s, biologists began to report another worrying phenomenon. Fish in some areas were growing more slowly, maturing earlier and laying fewer eggs than before. Not only was this an ominous sign for the sustainability of these fisheries, but smaller fish are less valuable than larger ones because they yield smaller fillets. 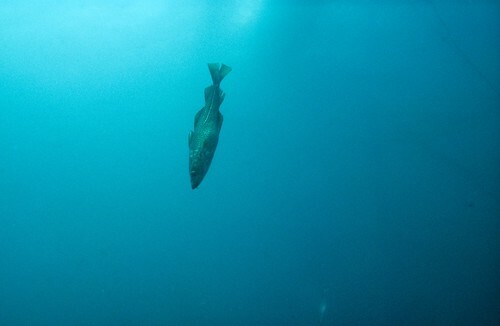 Explanations for the shrinking fish have ranged from changes in seawater temperatures to a decline in food resources. But the real culprit could be the practices devised to protect the fisheries. As mandated by various laws and treaties, most trawlers' nets sport a large mesh that allows small, young fish to wriggle free. The reasoning is simple: harvest only the oldest, fattest members of the population and let young fish live to spawn and contribute to the next generation. Fisheries scientists and conservationists support size restrictions because they are thought to protect populations, and fishermen are happy to concentrate on large, high-value fish. But what if the underlying theory is wrong? Over the past five decades, scientists have come up with little evidence that reducing the catch of juveniles or small fish has improved the annual harvest. Instead, a small chorus of researchers is now arguing, fish are adapting to size restrictions by investing their energy into reaching sexual maturity earlier instead of growing large. And as a result of their small size, they produce fewer eggs. Although these scientists do not deny that overfishing is the greatest threat to fisheries, they say that this evolutionary pressure will have a pernicious impact that will be hard to reverse. “You can safely ignore it for a couple of years, but it's accumulative, so the problem keeps growing,” says Mikko Heino, a biologist at the University of Bergen. The theory is controversial, and many scientists are unconvinced. So last year, Heino turned to Norman's 100-year-old preserved cod scales for help. He extracted DNA from them and is piecing together the whole genome sequence of this fish and others in a hunt for changes in growth and development genes that might explain the species' shrinking size. But even if the evolution idea is true, there is some disagreement over what to do about it. Only “a shrinking minority of fools” think that increasing fishing pressure on juveniles is smart or sustainable, says Carl Walters of the University of British Columbia in Vancouver, Canada. The theory of fisheries-induced evolution can be traced back to 1981, when the Canadian fisheries scientist William Ricker suggested that coho salmon (Oncorhynchus kisutch) and pink salmon (Oncorhynchus gorbuscha) were maturing at a smaller size because Japanese gill-net fishermen were targeting only the largest fish on the high seas1. By the 1990s, researchers had begun to notice the phenomenon in other species too. But for many years, the consensus was that environmental factors such as climate change and pollution were at play, not genetics. Then, in 2002, David Conover and Stephan Munch at the State University of New York in Stony Brook published a contentious experiment. They caught Atlantic silverside (Menidia menidia) off the coast of Long Island and established six captive populations of around 1,000 individuals each. After 190 days, they removed 90% of the fish from each population. In the first two populations, they took only the largest fish; in the second two they took only the smallest fish; and in the final two they took individuals of random size. They then stimulated the remaining 10% to breed. After four generations, the fish in the large-harvested populations were about one-third the average weight of those in the random-catch group. The dispute intrigued Heino, a theoretical biologist, who had begun working on his own approach to studying the life history of fish. In the past, researchers would chart a population's maturation reaction norm — the size and age at which fish typically become sexually mature. But Heino realized that comparisons of maturation reaction norms between populations could be misleading if they didn't take into account the variation in growth rates caused by food availability, climate or other environmental factors. So Heino developed a probabilistic approach that considers growth-rate variations. Using this technique, he showed in a 2004 paper in Nature that northern cod (Gadus morhua) born in 1987 were maturing at a younger age and a smaller size than those born in 1980, and these changes preceded a dramatic collapse of the species off the coast of Canada in the late 1980s and early 1990s (see 'A shift in maturity'). “It's the most famous fisheries collapse in recent times,” says Heino, “You would expect the potential for rapid evolution.” Heavy fishing was the main cause of these changes, Heino says, but size-selective fishing compounded the problem. Critics point out that the trend coincided with colder water, heavy sea-ice cover and other factors. Nevertheless, Heino's technique opened up a new field, called Darwinian fisheries management, and evolutionary biologists were soon trying to measure the impacts of size restrictions on other wild populations. A 2009 study used Heino's method to conclude that, of 37 commercial fish stocks, the majority were maturing earlier and at a smaller size than in the past, and that these effects were strongest in heavily fished populations. Jeff Hard, a geneticist with the US National Oceanographic and Atmospheric Administration Fisheries Service in Seattle, Washington, says that in 1976 the largest class of female salmon — those greater than 100 centimetres in length — accounted for more than 20% of the fish spawning in one Alaskan river. Today, that number is less than 4%, and the number of eggs that females are producing has declined by 16%. But without genetic data from this and other populations, the findings can always be attributed to environmental changes. “It's almost impossible to prove these things,” says Andrew Hendry, an evolutionary ecologist at McGill University in Montreal, Canada. That is why Heino and others are looking to the DNA from historical samples of cod and other species for help. Filip Volckaert of the Dutch-language Catholic University Leuven in Belgium, for example, is sequencing DNA from otoliths, or ear bones, of yellowfin sole (Limanda aspera) from every decade back to the 1950s to identify genetic changes that might be linked to growth. And Heino is complementing the genetic work with his own brand of lab experiment. Inside a special room at his university, he now has nine populations of guppies, and harvests between one-quarter and one-half of the population on the basis of size. To make the experiment more natural than that of Conover and Munch, he allows the guppies to reproduce freely at any age. And, as in nature, the breeding populations contain a wider range of ages and sizes. He expects the experiment, which he started in 2009, to run until 2014. But it will take a lot to convince the sceptics. “Fisheries-induced evolution is an interesting side issue, but it's been greatly overblown,” says Ray Hilborn, a fisheries scientist at the University of Washington in Seattle. There is no question that fished populations are evolving, he says, but some traits, such as earlier age of maturation, may make some fish populations more productive, not less so. The data suggesting that growth rates are slowing are also not yet convincing, he says. The best way to preserve fish populations is simply to fish less, he says. Heino agrees, but wants to see other changes in marine policy. For example, he does not think that marine reserves should protect only spawning grounds — a common conservation strategy — because that gives another advantage to early-maturing fish, which return to the spawning grounds to breed sooner than late-maturing fish. Second, he says that it is time to abandon most size limits. Support is growing for these views. Last year, an international group of fisheries experts published a policy paper in Science rejecting size limits for a wide range of reasons, including evolutionary issues. Jeppe Kolding of the University of Bergen studies small-scale fishing in Africa, and has found that areas where fishermen use illegal nets that catch large and small fish alike tend to have food webs that are diverse, intact and resemble unharvested areas, only with lower biomass. When fishing pressure is spread across species and sizes, he argues, fishermen can net more fish, yet the risk of wiping out individual populations is lower. “How can you tell me this is a bad fishing method?” he asks.